Did you hear that Mr. Boie app has released & now available in App stores & Google play stores for download? Wondering what this app is all about? Well, do not scratch your head with a deep thinking face. In this blog post, we will guide you towards two things – first, what is Mr Boie. app? & second, why does this app should be in your smartphones right now. 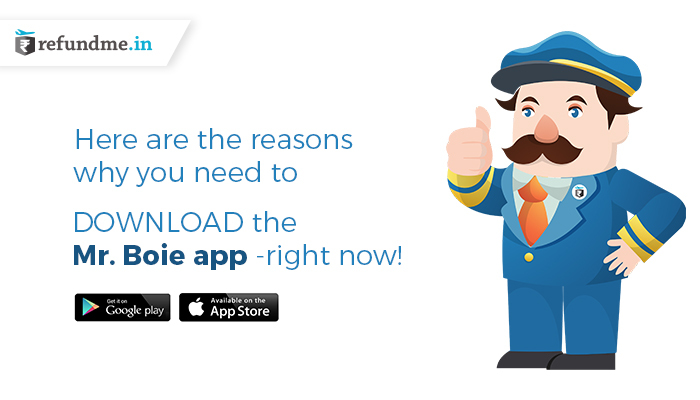 So…what is Mr. Boie app? Mr Boie. app is the virtual flight assistant that guides you & many other travellers with what they need to prepare with – during or around the air travel. It is an app that foretells your flight status, guides you with the airport itinerary, tells you how you need to manage your travel documents, offers you access to your favourite drink/beverages at one click, books your cab to head inside the city and even claims your cancelled or denied flights compensation legally- cool right? The app positions all the elements that any traveller need to be geared with during his air travel. From airline or airport information to guiding about the expenses of the journey, this app is your personalized manager (that won’t even take the salary to do his job). You even get to track down your expenses, create a proper & planned trip & amalgamate with other travellers to hear out their stories & experiences. So no matter solo traveller or a groupie, this app will foster you will every travel hacks & information that you often had to Google out. Real-time flight status – What’s best than being able to know about your flight status that too in real time. The app utilizes automated technology & certain algorithms to foretell about the flight status and even gives you an estimated delayed flight status. This way, you get to have the time to figure out your flight pattern & has all the time in the world to prepare with alternatives. Airlines & airport information at a click – Now we know how hassled it is to carry a mobile in hand to learn about the airport’s itinerary. The app has the database of the airlines & the airport information to let travellers have easy strolling around the airport. Whether searching for the lounge to relax or some medical facilities, the app tells you all about where you can find them at or around the airport. Boarding pass scanner – You do not have to write all your lengthy flight details to enrol inside the app. If you have a boarding pass handy, just scan the barcode & rest the app will do it for you. This app has a system that can easily decode the barcode with any trouble. Frequent flight info – The app is more than just about already planted information. Since the app works in real time, it helps travellers have every newest update about – be it boarding gate announcements, baggage belt info or the changes in gate timings – the app rings you up with every latest happening or proceeding at your airport. Automated flight compensation – Travelling may call for non-anticipated events like cancelled flights or denied boarding. To beat them, airlines have this liability to pay out the air travel compensation for such situations which calls for compensation amounts maximum to INR 20,000 in Indian borders. If you are stuck in such a situation, the app can do the wonders for you by letting you have the sum. First, scan your boarding pass details into the app to generate a claim & mention the condition you are stuck with. Second, the executives of refundme.in will get in touch with the passengers to have the proper case study of the event with the detailed narration of the event. Third, the team will take the legal & authoritative actions to file a claim without charging any fee until the expected result is not derived. Fourth, the executives will drop a call or email to correspond regarding the fact that your compensation has been reimbursed successfully. So the next segment is why it should be in your mobile phones or smart devices right now? You get to have all the travel-related information in real-time without waiting & loading time. You get to have a virtual assistant who would be happy to help you claim for your cancelled or denied boarding compensation that too with no win – no fee policy & claim it until you get those digits in your bank account. An automated app that tracks down your flight status & saves your time to plan for the alternate travel options. Easy-peasy methods to order the cup of favourite coffee, snacks, even cab facilities before you even arrive at the airport at just one single click. A sorted manager that just stays with you during your journey & updates you with every significant flight or travel related details. All you have to do is, visit the App store or the Google play store, download the app, create a trip & voila you have access to all this you just read above without any glitch & difficulty. Explore more things you can do or get access to with this app. And also, mention what part of the app you like the most in the comments & share your valued suggestions too for the app – so that it could become the world’s most sought-after travel assistant. To download the Mr. Boie app, click on the below links! Mr. Boie app on App Store.